Today’s story comes from 2 Samuel 11-12. 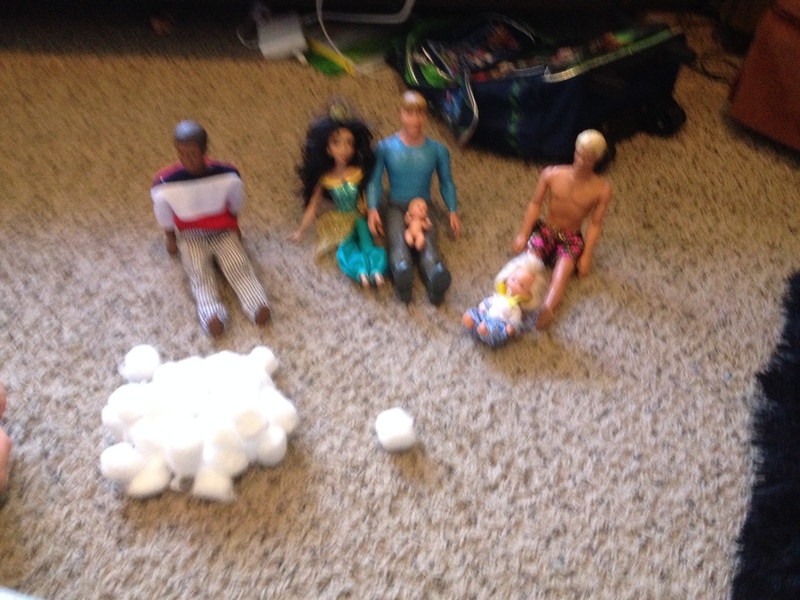 I told today’s story using a handful of cotton balls and Barbies (a girl, 3 boys and 2 babies). You can use Barbies or any kind of creature you have at your house. But i think this story is best told with some visual aids as there are a lot of characters. Up until now, the Bible shows king David (male character 1) making some great choices. God chose him to be the new king over Israel. He was brave and strong and a man who loved God. But even people who love God make mistakes sometimes…even BIG ones. One time, David sent his fighting men out, but he stayed at his palace. One evening he looked out and saw a woman (the girl character) taking a bath and he thought she was SO pretty. He sent someone to tell her to come to the palace. David’s servants told him she was married to a man named Uriah (male character 2), who was out fighting. So the woman, Bathsheba went to meet David (because you DON’T tell the king NO) and he decided he liked her so much he wanted to marry her. This is not a good thing, because she was already married. So David told Joab, his top leader, to send Uriah out to fight in the very front (so the enemies would be able to kill him and then David could marry Bathsheba.) This was a terrible choice!? HE was TRYING to get Uriah to die so he could take his wife! Uriah was a good soldier so he obeyed and went out to fight in front and he did die. Bathsheba was very sad because she loved her husband…and after a little while king David sent for Bathsheba to come be his wife and live at the palace with him. God was NOT happy with David’s bad choice. And he was about to give David a very bad consequence. God sent Nathan (male character 3), the priest (a worker in God’s church who spoke the words of God to His people) to tell David that God was not happy with him. It was probably scary to go before the king and tell him he was WRONG, but Nathan knew it was more important to tell his friend what God had to say than to be scared of what his friend might say. Nathan came to David and told him a story. There were two men in a city. 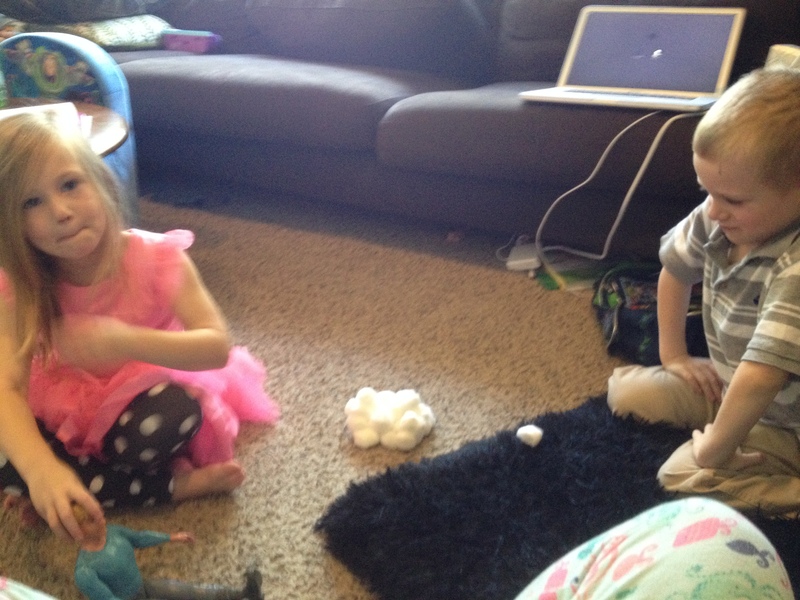 One had a LOT of money and a LOT of sheep (a big handful of cotton balls). The other man had just one sheep (one cotton ball). One day, a visitor came to town and was hungry. The rich man took the poor man’s one little sheep and killed it and cooked it and gave it to the hungry visitor. Now the rich man still had ALL his sheep and the poor man had NOTHING. Now Bathsheba had a baby growing in her belly (baby character 1). It was going to be David’s son. But because David had done a very very bad thing, the baby died as his bad consequence. David said he was so so sorry and asked God to please forgive him. David was very sad, but he knew God was in charge. Later, David and Bathsheba had another baby boy (baby character 2). They names him Solomon. He would grow up to be king after his father, David and he would be the one to build God a real temple (church). We know that all people sin sometimes (that means disobey God). All of us, and every person in the Bible (except for Jesus) makes some good choices and some bad choices. If we ask God to forgive us, He ALWAYS will. He won’t stay mad at us and He will help us do better next time. But that doesn’t mean we won’t have bad consequences for our choices (like a punishment). David was called a “man after God’s heart” because even when he did make bad choices, he still knew God was in charge and that he could turn to God to help him and love him. When we sin, we can know that God will forgive us if we ask Him to, that He will help us do better next time (sometimes by letting us have a bad consequence) and that He will always love us.